This is a pretty simple topic. Are OA sashes available in more than one length. 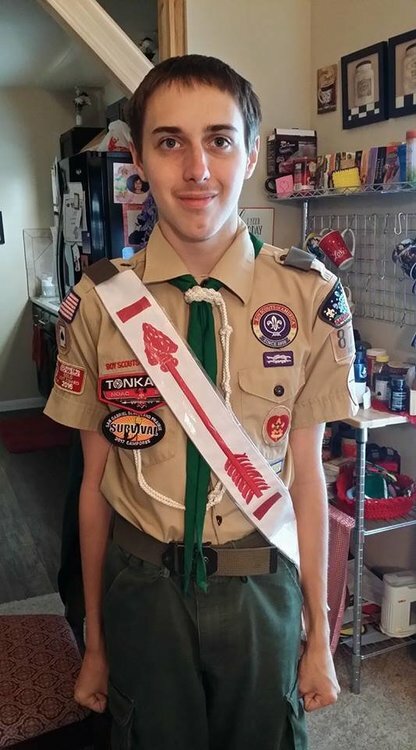 My older son completed his ordeal this weekend and came home with a sash that hangs to his knees. He's about 5'6" and the 75-1/2 inch sash looks great, but could look a lot better. We have his uncle's sash here from the mid-1950s and it measures 59" end to end and fits much better. Is a second size, smaller than 75 inches, available? Thanks! I could not find anything at scoutstuff.org. Depending upon how your local council handles things, either they will be able to sell you one, with evidence of membership (usually the membership card) or tyou will have to go throught he lodge. My council has everything OA related goignt hrough the lodge. The standard sash is 65" long. It sounds like he received a long sash - 75" long. Safety pins. Worked for me until I "grew into it". He should only wear the Ordeal sash until he seals his membership to Brotherhood. Have him tough it out until then. Shouldn't be that long. Oh Jezzzz.... Anyone Sew Anymore? Another thing..something I did..I put a Piece of Velcro on my Sash and Uniform to keep the sash from slipping down all the Time...Kept the Arrow upright and at a Good height all the Time. Just fold the sash over like an "s" at shoulder level and drop a roll of stitching at the top and bottom of the "s", will take less time then this post. I miss the days when scouts had to know how to sew to earn Second Class. That won't really work correctly as the length needs to be removed from the two ends, not the middle. Also, I think that would look bad. My wife did this to my sons Ordeal and Brotherhood sashes. Looks fine and you can't see any difference other than his sash doesn't hang to his knees. So, I was given a "long" sash when I received my Brotherhood honor last week. I am a smaller guy, and that thing went to my knees! Luckily the Scout Shop was understanding when I took it back and let me exchange it for the normal, smaller size, which fits perfectly.